If you have a website suffering from any kind of negative ranking signal in the search results, such as something like Panda or Penguin, a manual action or just a regular algorithmic downranking, app indexing isn’t a “get out of jail free card” for those sites hoping to get their app indexed pages ranking when their site cannot. Mariya Moeva from Google said that rankings for app indexed pages are based on both signals from the webpage itself as well as from the app. But in cases where there is an issue with the website, app indexed deep links likely won’t show in the search results. 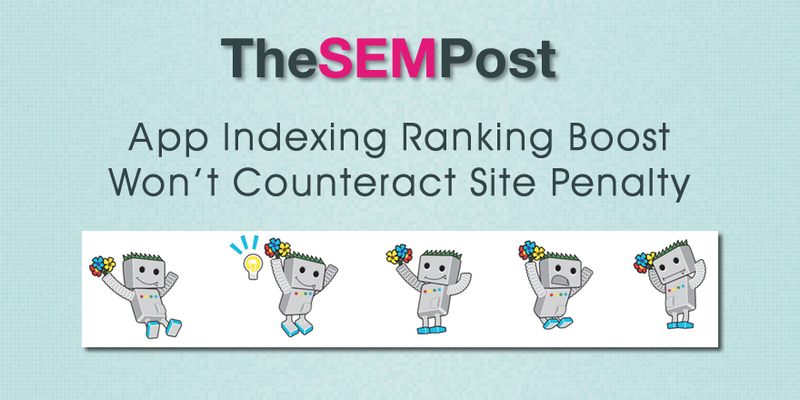 Moeva also added that the app indexing ranking boost isn’t strong enough to counter an algo issue impacting a site. So if your site isn’t ranking well in the search results, app indexing won’t be a surefire way to rank higher, even with the ranking boost applied.